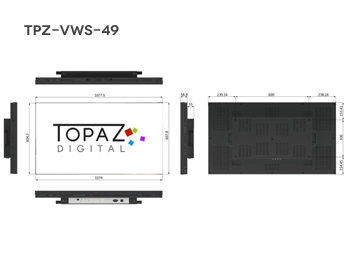 Our TOPAZ Video Wall displays provide a near seamless bezel with a combined bezel thickness of just 3.5mm between the 2 screens! This delivers breath-taking results when a real impact is needed creating a near seamless image on a big scale. 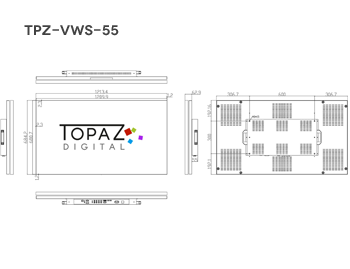 Designed for digital signage applications and intended to operate 24/7 this display features an Inbuilt Video Matrix Processor meaning the displays can be connected together to create a video wall and will automatically tile the content with no additional hardware needed! These feature rich displays also feature a dedicated Temperature Control System with the internal fans keeping the display and internal components operating at the optimum temperature ensuring longevity for the display. These displays feature a wide range of inputs making it easy to connect your media source to the video wall. Packed with even more power & functionality these displays will not only look great but deliver stunning performance. 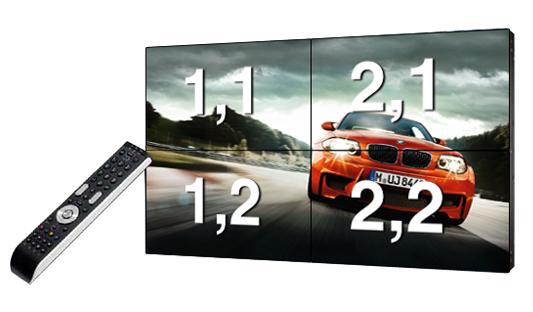 At a combined width of just 3.5mm these displays offer a seamless video wall delivering maximum results. The intuitive temperature control system even allows you to set the desired temperature for the fans to become active ensuring the displays and their internal components operate at the optimum temperature! Reduce power consumption and operating costs by automatically scheduling your displays to switch on & off.